January 31st is the deadline for filing and paying your online Self Assessment tax return. If you’re a locum GP then this month may see you scrambling together paperwork, searching for government ID references and trying to make sense of your finances. When I started working as a locum GP I found learning how to manage the business side of self employed work was a challenge. It was difficult to know how to be tax efficient, what expenses to record and how to ensure the correct amount of tax is paid. 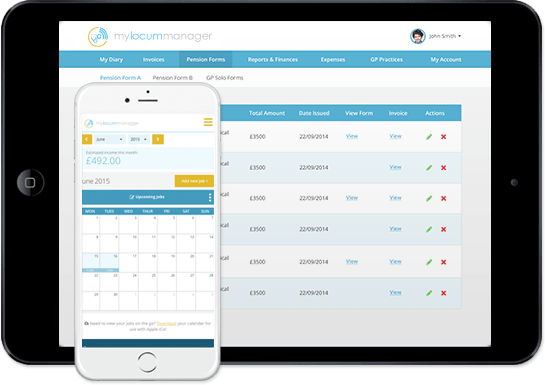 This led me to collaborate with medical accountants to create MyLocumManager - a smart software that seamlessly integrates your invoicing, pension forms, expenses and tax. This saves hours of time, money and stress when it comes to managing your money and filing your tax return. Here are my 10 tips for submitting your tax return as painlessly as possible. As a self employed locum GP you will need a full record of your accounts and your expenses. You also need to review your bank statements and record how much interest you have accrued over the last tax year. Trawling through mountains of paper, receipts and statements to prepare for your tax return is a laborious process. This can be streamlined and simplified using smart software like MyLocumManager.com. This not only saves time, but is a more accurate way of record keeping. If you’re filing online for the first time, you need to have your unique taxpayer reference (UTR), which can be found on letters from HMRC. You’ll then need to create a Government Gateway account, and your activation code will be sent in the post. Activation codes usually arrive within 7 days. If you’ve used the Self Assessment online service before, you’ll have a Government Gateway user ID number, which was posted to you when you first signed up. You need to dig this out to sign in to your HMRC online account, along with your password. If you have misplaced your login details you can find out how to get new ones here. You can subtract business expenses from your income to work out your taxable profit. These are called ‘allowable expenses.’ It’s important to have a good understanding of which expenses are allowable, so that you pay the right amount of tax. When you’re calculating your income for the tax year and the expenses you’ve incurred, ensure you cross-reference your numbers. For example, check you have been paid for each locum session, have a record of the pension payments that you’ve made, the mileage you have accumulated over the tax year and the expenses you have incurred. Also check your bank statement to make sure that the payments you’ve actually received match the invoices you’ve issued, and check that payments going out of your account match the receipts you’ve saved. This can be an laborious and time consuming task and it will be much easier if you can automate the whole process using a software like MyLocumManager.com. It also helps if you have a separate business bank account. A good 2018 finance resolution could be to simplify all the record keeping that comes with locum work using digital tools like MyLocumManager and to open a business bank account, so that your tax returns are more straightforward in the future. In the 10 seconds it takes to sign up to MyLocumManager. You can save hours of stress by combining all your invoices, pension and expenses into an easy to use single platform. Pensions are a tax-efficient form of saving. You receive tax relief on contributions that you pay into your pension. Your Self Assessment tax form is the place to claim additional tax relief on your pension contributions: another 20% if you’re a higher rate taxpayer, and an extra 25% if you’re an additional rate taxpayer. You can currently get tax relief on pension contributions up to 100% of your salary, up to a maximum of £40,000. If your Self Assessment return is late, you’ll have to pay an immediate fine of £100, and then penalties will keep piling up if you still don’t file your return. If you pay your tax bill late, you’ll be charged interest on your outstanding tax bill. If you don’t think you can pay your bill, contact HMRC and they may be able to extend the deadline or let you pay in instalments. Once you’ve filed your tax return, you need to actually pay your tax bill! The deadline for paying your tax is the same as the deadline for filing your tax return: 31st January. The payments can take a few days to clear, so ensure you transfer the money before the deadline to ensure it is processed before the deadline. Hiring a good medical accountant can save you money on tax and spare you the time and effort of completing your tax return. Your accountant can also advise you on ways to be tax efficient. Accountant fees are also tax deductible. MyLocumManager works closely with specialist medical accountants that we are happy to recommend to our members. At the end of each tax year you can download your tax data from MyLocumManager at the press of a button and submit it to your accountant so they have all the information they need to accurately calculate your tax. If completing your tax return this year’s been stressful, start putting measures in place now to make future tax returns more manageable. Start by setting up a business bank account that separates your self employed work from your personal account. Automate the record keeping using MyLocumManager. You can sign up for a 3 month free trial and see how much it can help you. Dr Surina Chibber is a portfolio GP in London and co-founder of MyLocumManager.com.